Feel like saving the planet this weekend? Okay, that sounds like I’m asking you to be a super hero, but I’m not. 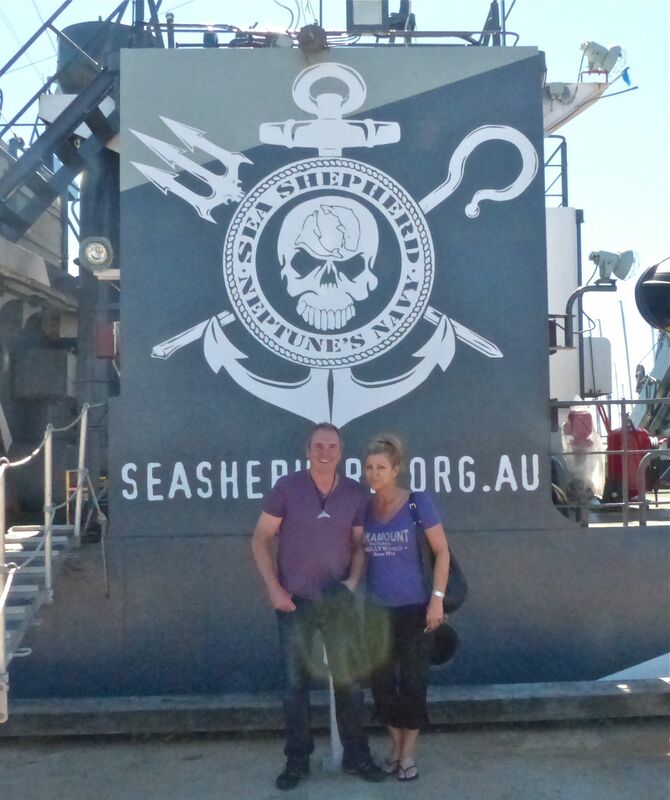 You really can contribute just by visiting the Sea Shepherd ships which are dockside in Melbourne at Williamstown and open to the public for tours this weekend. Donating helps too. Not just money – long-life food stocks that Sea Shepherd can take on its missions are greatly appreciated because it’s an organisation that relies completely on the generosity of supporters. There’s also a stall where you can buy Sea Shepherd t-shirts and souvenirs. 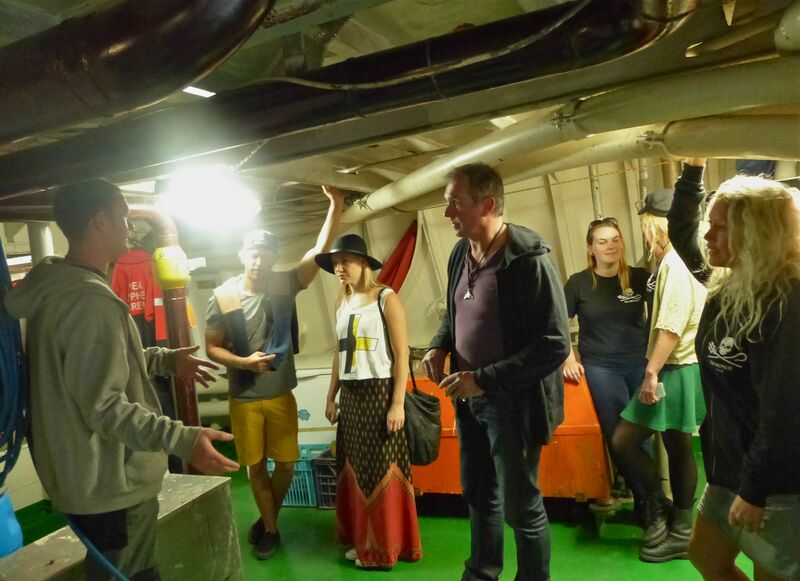 We went along for a tour of the ships last weekend and it was a real eye opener. Fletch’s fellow Neighbours actor Saskia Hempele and her partner, TV presenter Kayne Tremills also joined us. 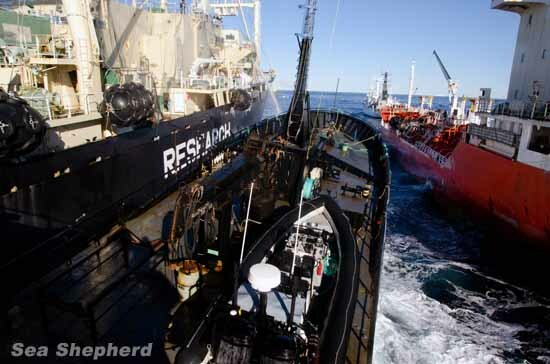 Just in case you haven’t heard about Sea Shepherd, these guys put their lives on the line trying to prevent the illegal poaching of protected whales and dolphins. 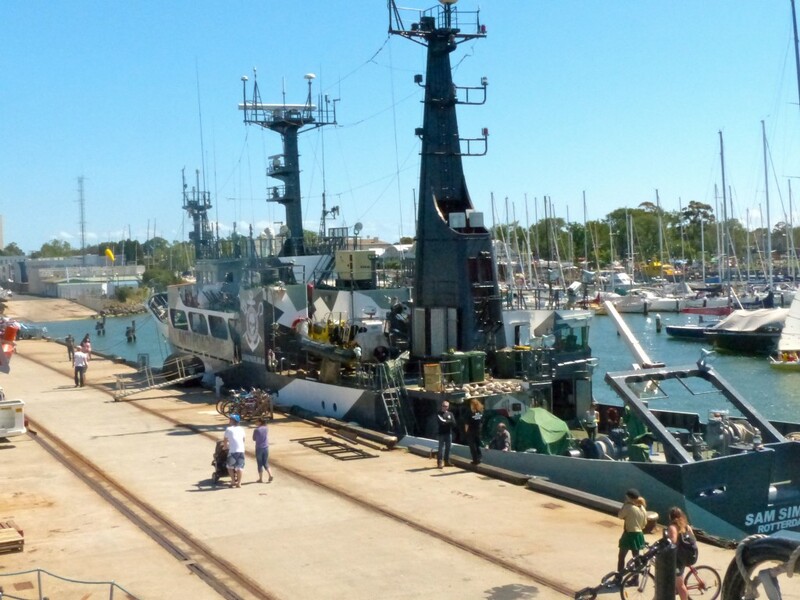 We were also shown a couple of videos of clashes with Japanese whaling ships and I can only imagine how terrifying it would be to be caught on one of their smaller boats, being deliberately rammed by these massive vessels. The Bob Barker being rammed by Japanese ships in February this year. This ‘direct action’ is heavy stuff. The Australian arm of Sea Shepherd makes an annual pilgrimage to the Southern Ocean whale sanctuary every year. ‘That’s been a whale sanctuary since 1994 and whaling has been banned since 1986,’ explained Ben. ‘But the Japanese whaling fleet continues to whale illegally – under a legal loophole which allows them to whale under the guise of scientific research. They go after either Humpbacks, Fin whales and Minkes which are endangered or close to being endangered. Was anyone hurt in this campaign? ‘No, we’re aggressive but not physically violent. We’re not out to harm anyone. They’ve never lost anyone and we’ve never lost anyone. The only injuries that have been caused happened when some of our crew was pelted with large nuts and bolts from the whalers. They also swung a grappling hook at us,’ he said. 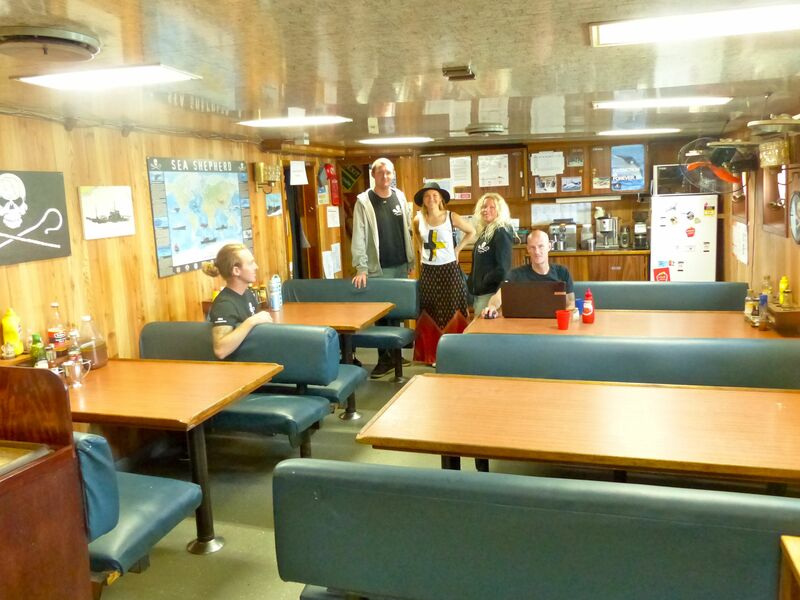 Next stop was a tour of the dining quarters. If you want to volunteer to be part of a Sea Shepherd campaign, make sure you’re happy to go vegan. After hearing about the horrific slaughter of whales and dolphins all day, it’s something I’m going to have to seriously consider. 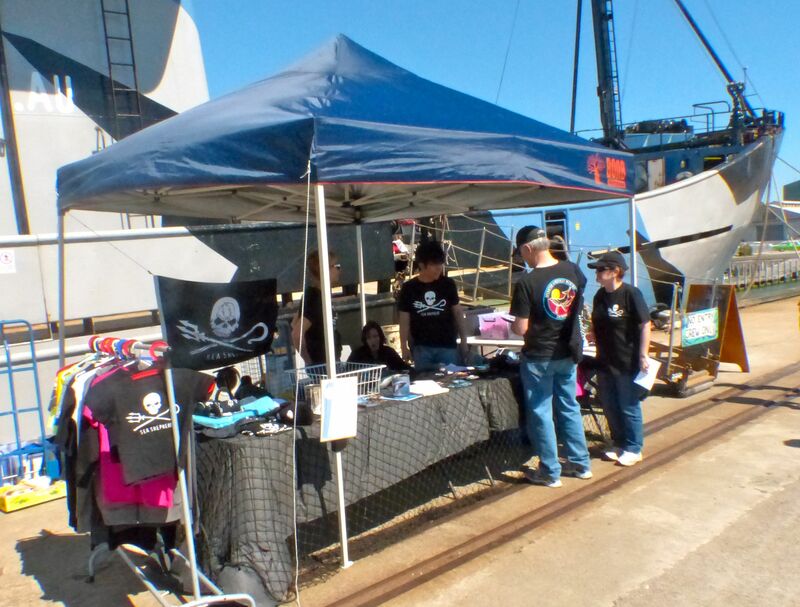 Worldwide support for Sea Shepherd is growing rapidly. It was fascinating to hear how so much has been donated by the US celebrity set. The Bob Barker ship, for instance, is named after the US games show host from The Price is Right, who donated a whopping FIVE MILLION DOLLARS to not only buy the ship, but a helicopter as well. Actor Pierce Brosnan is on the board of directors.